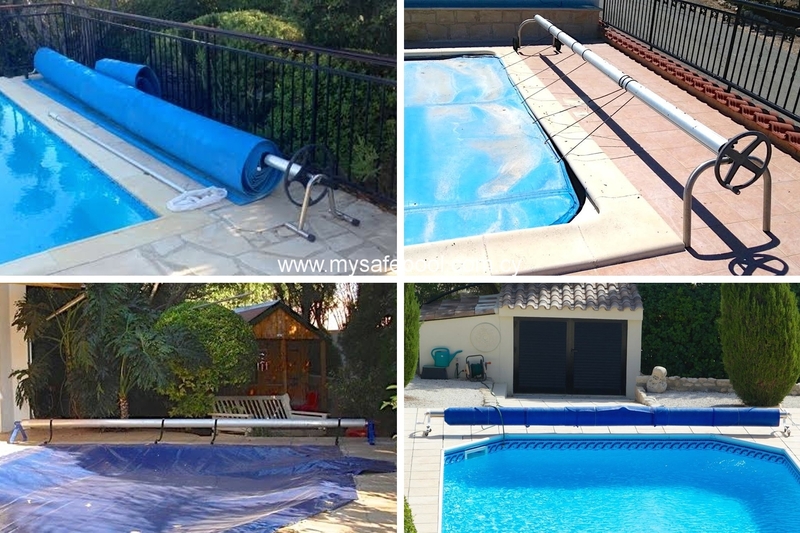 WHAT IT IS: If you don’t already own one, a roller is a mechanical device which enables you to lay your solar cover onto the pool, and then remove it from the pool when not required. A roller comprises a central tube supported at each end, onto which the solar cover is attached. It’s usual for one end support to be fixed, while the other will have two wheels. The central tube is turned using a winding handle to allow the cover to be wound onto, and off, the roller. We searched far and wide to find the most featured, robust, stable and best-made roller we could find…and we’re pleased to introduce you to our Artemidos Roller. First and foremost a roller needs to be stable so it won’t topple over with the weight of the cover. For this reason our Artemidos Roller is solidly built with widely-braced supports each end. 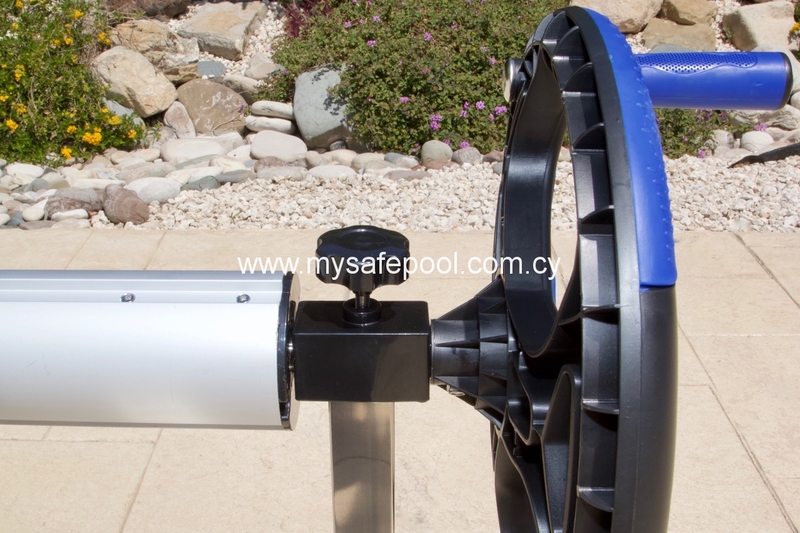 The roller should be easy to move, which is why the Artemidos Roller has large 18cm diameter wheels, as opposed to castors, small wheels or no wheels at all (common shortcomings on other rollers). The winding handle is large, making it easy to wind the cover on to the Roller. 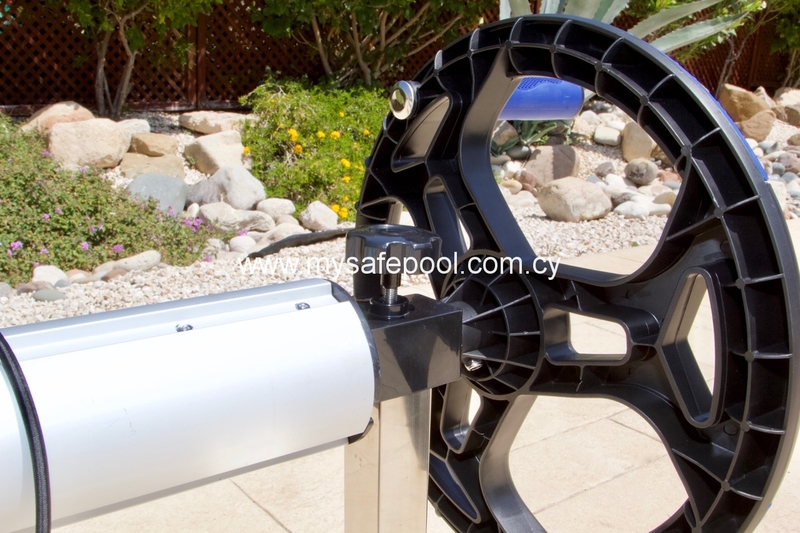 The centre tube is made of aluminium and is wide-diameter (90mm), so that it doesn’t bend under the weight of the cover. Each end of the Artemidos Roller has a locking pin to prevent the cover unraveling from the Roller, especially useful in windy conditions. Most rollers do not have this feature. 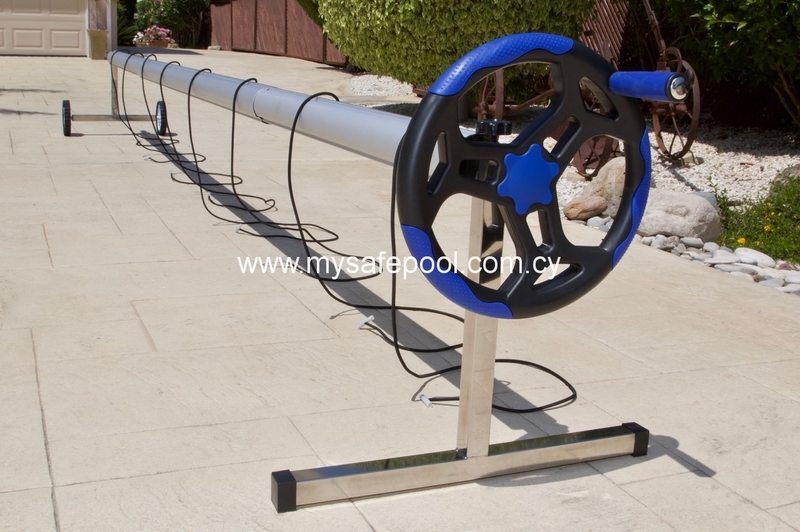 The Roller comes with multiple bungee-type straps, which attach to any cover with eyelets. The straps can be positioned anywhere along the centre tube. 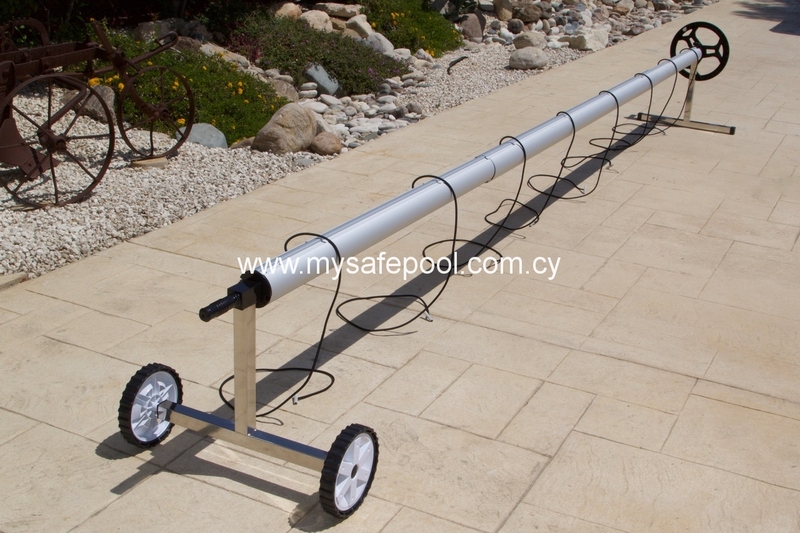 The centre tube can be extended to accommodate any solar cover up to 5m wide. 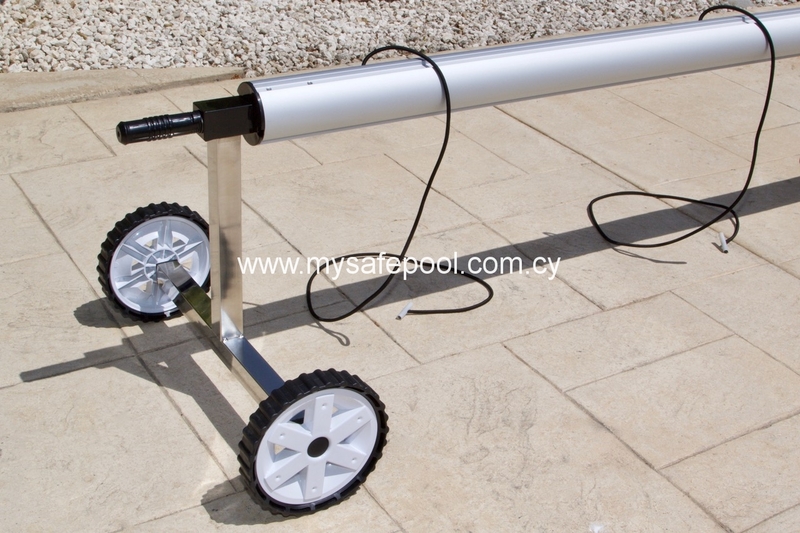 We also supply a wider version of the Artemidos Roller to take covers up to 7m wide. We normally supply our Artemidos Roller in DIY kit form. The kit comes in two boxes 246x21x11cms 9.5kg and 65x57x12cms 6.6kg. Combined weight 16.5kg. Assembly will take 20-30 mins, with a minimum level of DIY skill required. Basic tools are needed, including a hand drill. However, if you prefer we can assemble the roller for you and deliver it to your home or business address (see table below). WARRANTY: Our Artemidos Roller comes with a 1-year pro-rata guarantee, conditional only on the roller being correctly assembled from the outset.